Around 10,000 BC the weather warmed up and as the ice sheets retreated the landscape that was revealed was dotted with many boggy lakes. Woodland started to regenerate slowly, with birch trees leading the way. 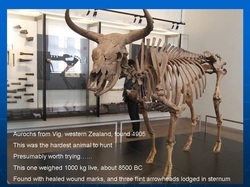 Large animals like mammoth, aurochs and giant deer disappeared or greatly shrank in number at around this time. It's not entirely clear how much of this was due to their habitat disappearing, and how much humans played a part. Star Carr http://www.starcarr.com/ is a site that has typified the Mesolithic Period.